This Ultrafine small combset has 3 rows of tines. 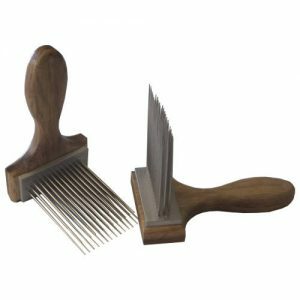 This comb has been specifically designed for fleeces which are less than 18 micron. The ultra fine spacing between the tines make them also suitable for short fibres. This kit comes with the comb set, an accessory kit and the comb holder for $210.00 which is a saving of $10.00.